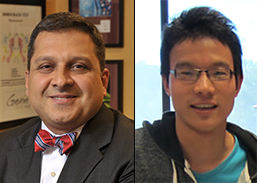 Senior author Ali Shilatifard, PhD, chair of Biochemistry and Molecular Genetics, and first author Fei Chen, a PhD student in Shilatifard’s lab. Northwestern Medicine scientists have identified the molecular machinery that releases paused gene expression, a finding that helps explain how important developmental genes jumpstart simultaneously. The process of gene transcription begins when an enzyme called polymerase II (Pol II) and other factors assemble at a DNA sequence upstream from a gene at a spot called a promoter. For about 20 years, scientists have known that Pol II sometimes pauses at promoters – holding back the initiation of transcription – but they didn’t know how. Now, Ali Shilatifard, PhD, chair and Robert Francis Furchgott Professor of Biochemistry and Molecular Genetics, PhD student Fei Chen and other members of Shilatifard’s laboratory showed that a protein called Pol-II-associated factor 1 (PAF1) controls the release of Pol II to regulate the expression of developmentally regulated genes. The findings were published in Cell. In the study, the scientists demonstrated that deleting PAF1 releases paused Pol II at thousands of genes. Many of the genes with this pausing mechanism have a role in embryonic development, where synchronous gene expression is important. The findings could also have applications for latent viruses such as HIV that stay dormant – and resistant to therapies – in cells for many years. Future research will try to make that goal a reality. First, however, the scientists have to figure out how to remove PAF1 at specific genes, so that it doesn’t release Pol II everywhere at once. This study was supported by National Institutes of Health grants R01 GM078455, R01 GM105754 and R01GM069905.